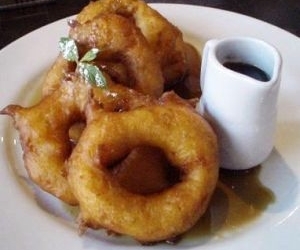 Picarones | Sweet Potato Fritters is a Peruvian food recipe for a fried doughnut served with homemade syrup. Bring the canela stick, anise, cloves and water to a boil in a Dutch oven. Add the sweet potato and the pumpkin and boil until soft. Drain and set aside. Pass the sweet potato and the pumpkin through a food mill. Combine the puréed sweet potato and pumpkin with flour and sugar. Add the eggs one by one until they are incorporated into the dough. Dissolve the yeast in warm water with a pinch of sugar for 10 minutes. Add the yeast to the dough and mix on medium speed for 15 to 20 minutes. Let the dough rest for 2 hours covered in a warm and humid area. Transfer all of the ingredients for the syrup, except for the raisins, to a large saucepan and bring to boil. Simmer until the syrup reduces and thickens, about 30 minutes, then add raisins. The syrup should be slightly thick. Heat the oil in a large Dutch oven to 350F. Using your hands scoop a large pinch of dough and drop into the hot oil. Work quickly using a wooden skewer to form a hole in the dough. Fry until golden brown and drain on paper towels.